*Update: IOA sent renewal COIs for the forthcoming August 1, 2019 - July 31, 2020 coverage period for youth programming this morning (April 4). Unfortunately, due to an IOA system error, you may have received COIs from outdated requests for events/facilities that you do not need. Please disregard these emails. We sincerely apologize for the influx of emails and confusion. US Club Soccer is transitioning the coverage period for the liability insurance provided to members for youth programming from a calendar year basis to August 1 – July 31, to align with the registration year. Because of this transition, the current policy runs from January 1, 2019 – July 31, 2019, and therefore existing Certificates of Liability Insurance (COIs) expire on July 31, 2019. 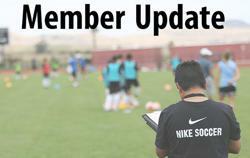 In order to aid our members and membership administration staff in this transition, US Club Soccer will automatically issue COIs for August 1, 2019 – July 31, 2020 to all members who, as of Wednesday, April 3, currently hold COIs for January 1, 2019 – July 31, 2019. These reissued COIs for the new coverage period will match the current COIs and be sent via email later this week. The emails will be sent from mail-server@csr24.email with Proof of Insurance for National Association of Competitive Soccer Clubs dba US Club Soccer as the subject. This transition will not alter coverage for January 1, 2019 – July 31, 2019. Please note that insurance coverage is only valid if membership requirements are met. For example, if a COI is issued for August 1, 2019 – July 31, 2020 but the respective member does not continue membership in US Club Soccer during that time period, insurance coverage would not be in effect. For more information, please visit the Insurance web page on usclubsoccer.org or contact your respective Membership Administrator. Thanks for your support of US Club Soccer.